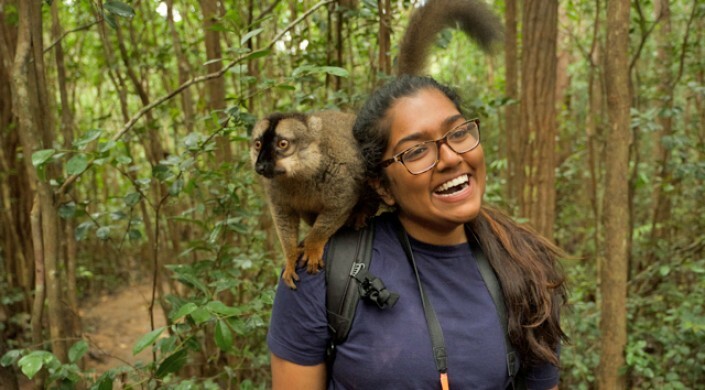 After hours of hiking deep into the thick rainforest of Madagascar, Akshaya Annapragada finally reached the group’s destination—a tiny village of wood and grass buildings. The party entered the clearing, setting down gear they had lugged through the marshy undergrowth. Shielding her eyes against the blinding sun, Annapragada spotted the team’s objective scratching at the muddy ground. They had come halfway around the world to study chickens. Annapragada, A.B. ’20, an applied math concentrator at the Harvard John A. Paulson School of Engineering and Applied Sciences (SEAS), spent part of the summer in the African island nation, working with Christopher Golden, Research Scientist at the Chan School of Public Health, and his team to study the impacts of vaccinations on the poultry flocks of the Malagasy villagers. The fieldwork was part of a new fellowship program, the Planetary Health Undergraduate Scholars, sponsored by the Henry David Thoreau Foundation. For millennia, these rural communities subsisted on bush meat, like wild lemurs and birds, but villagers more recently have shifted to domesticated poultry as a protein source, Annapragada explained. Golden’s team is studying how that change influences food sources and nutrition. But Newcastle disease, a fatal upper respiratory ailment that affects chickens, is rampant in Madagascar and often kills 15 to 20 percent of a village’s flock each month. Vaccinating chickens against Newcastle disease is likely the best way to provide a sustainable food source. This summer, Annapragada and the Madagascar Health and Environmental Research (MAHERY) team worked with veterinarians to gather data on chicken populations in each village to determine the vaccination targets they should set to ensure villagers have enough food. At Harvard, she began working with Sarah Iams, Assistant Director of Undergraduate Studies in Applied Mathematics, to analyze a longitudinal data set reaching back to 2011. “Using that vaccination data, I am trying to inform predictive models so we can say, what do we think chicken survival is going to look like five years from now, and then work backwards to see what programs we need to put into place for vaccine intervention today,” she explained. The goal is to reach herd immunity. Once a certain percentage has been vaccinated, disease transmission is low enough that the population continues to thrive. But reaching herd immunity could create issues of its own. Researchers want to understand how vaccination will increase the chicken population, and also the ripple effects of that larger population. For instance, will villagers eat more chicken, and how will that impact their health? Will they sell more chicken, and how would that affect the local economy? Working on such a practical problem also creates its share of challenges, she said. Families move from village to village, sometimes taking chickens with them. Other times, local people’s estimates of chicken flock sizes end up being inaccurate. Those types of errors make it difficult to conduct a statistical analysis, so she has spent extra time cleaning and aggregating data. The opportunity to conduct fieldwork emphasized the urgency of this issue for the Malagasy. That’s something Annapragada keeps in mind as she unravels the information buried in massive sets of chicken population and vaccination data.